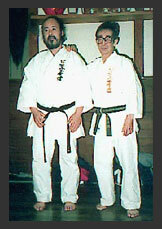 The Shukokai style was founded in 1950 by Chojiro Tani who studied Shito-ryu under Kenwa Mabuni. It is a style that brought pad work into Karate training, which resulted in the style becoming known for its hard hitting techniques and scientific approach to body kinetics. Shigeru Kimura brought the style the England in the 70s. Shukokai means ‘Way for All’ and this reflects how the style has developed. The style is very fast and uses a relatively high stance to aid mobility. Shukokai enhances the traditional styles of Karate by blending it with the logical principles behind modern sporting dynamics.